Local governments, funders and nonprofits will play a critical role in ensuring a complete and accurate count of hard-to-count communities in the 2020 Census. New Census Bureau Study: Text Messages Are No. 1 Requested Follow-Up Method. 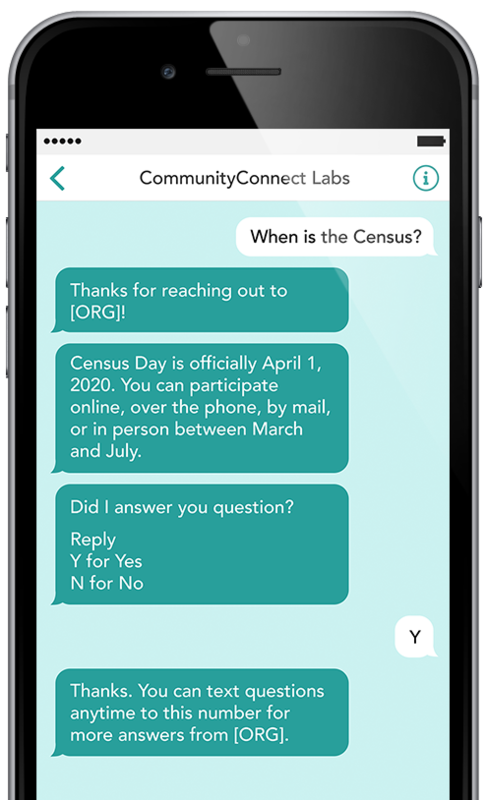 CommunityConnect Labs is the leading provider of training and technology solutions for local government and trusted messenger organizations to effectively conduct local outreach for the 2020 Census. The 2020 Census requires technology designed to reach hard-to-count residents. We build multilingual, easy-to-use technology that meets residents where they are. We have substantial experience working with local governments and service providers to provide information and services to hard-to-reach people. We worked in 9 geographies with city and county governments on the Local Update of Census Addresses (LUCA) phase of the Census. We are a member of the US Census Bureau's Opportunity Project. Provide a resource that can help find the nearest in-person assistance center, or can provide automated answers quickly and confidentially. Enable communities to easily, quickly, and conﬁdentially report misinformation or other problems with the Census to one another. Track and report on canvassing efforts in real time. Cut and assign turf. Lightweight - train users in just minutes. Engage hard-to-count individuals in an automated outreach campaign with timed follow-ups and reminders. Not an app: doesn't require nonprofits or residents to download an app. Our automated software sends messages to thousands of users with a single click. No costly and time-consuming text banking required. Full support for multiple languages to enable users to use our tools in their primary languages. Physical, electronic, and managerial procedures safeguard and secure information collected on our platform. Automated data reporting lets government and trusted messengers focus on outreach, not reporting. Easily export data or use the API to connect to your CRM. It’s important to obtain representative census data that not only provides an accurate portrayal of our diverse community but also ensures that San Jose receives its fair share of federal and state resources. Thanks to CommunityConnect Labs for helping our city leverage innovation to simply – and effectively – collect location-based data for our Local Update of Census Addresses (LUCA). Their text messaging tool will be particularly helpful in our community, where a growing number of our lowest-income residents live in non-traditional housing. Thank you for your interest in CensusOutreach. We'll be in touch soon.